Complete interactive APP, prepared by a dedicated team of exam experts, with everything you need to pass the Test of Essential Academic Skills (TEAS V)! The Complete TEAS V APP is a comprehensive tool for increasing your score! 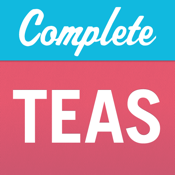 The Complete TEAS covers all content areas, math, reading comprehension, English grammar, punctuation, spelling, sentence structure and contextual words. Also includes the new science component, which includes, basic science, scientific reasoning, physics, biology, chemistry, anatomy and physiology. This interactive APP is a unique study system designed to get you up to speed fast, and get the best possible score! This is the APP version of the paperback with over 300 pages plus 2 free bonus extras! When you try our self-assessments or practice test questions, and get a wrong answer, you can review, and not only see the correct answer, but a detailed explanation, as well as multiple choice tips and strategies, exam tips from our dedicated team of exam experts! Complete Test Preparation Inc. is not affiliate with the makes of the TEAS V exam, Assessment Technologies Institute®, LLC, which was not involved in the production of, and does not endorse, this product. Review of all systems, including the circulatory, digestive, integumentary, reproductive, respiratory, immune, skeletal and urinary systems. Each in-depth tutorial includes, an overview of the system, functions, components (fully illustrated), common diseases and disorders as well as medical terminology. Maybe you have read this kind of thing before, and maybe feel you don't need it, and you are not sure if you are going to buy this TEAS APP. Remember though, it only a few percentage points divide the PASS from the FAIL students. Even if our test tips increase your score by a few percentage points, isn't that worth it? Why not do everything you can to get the best score on the TEAS?